"Power Struggle: The Art of War"
Superman and Jax-Ur engage in battle, with Superman's concern being Jax-Ur's son. While this occurs, Captain Marvel and the rest of the JLB contend with Superman robots under the control of Jax-Ur's son. Jax-Ur explains that he was the cause behind Superman's powers being thrown into flux. He goes on to tell Superman that once he's defeated Kal-El, he will open the Phantom Zone and let its occupants have at the Earth without restraint. Superman surprises Jax-Ur with a backflip, and alerts him to the fact that he's lost his powers before; Jax-Ur won't find him an easy fight, which Jax-Ur welcomes. The fight continues until Jax-Ur lays his hands on his son, for allowing the Flash to re-enter the battle. Superman knocks Jax-Ur back, and Jax-Ur's son becomes engrossed in the battle, letting his focus on the Superman robots wane. The Justice League takes full advantage and begins to press the robots back, but Jax-Ur reasserts himself using an unknown technology, and has Batman made unconscious. A robot uses Batman's hand to authorize the Zone's opening, and counts the seconds until Jax-Ur's plan will have succeeded. Story - 4: It's a shame that the book is bi-weekly, though it's advertised otherwise. It's not just that the story is lighter compared to what is given in most comics right now or that although they are "future" characters, they feel more familiar. The best thing about reading or viewing a serial, in this case, a comic book, is when regardless of a "done-in-one" or a multiple-parter, the read is a rewarding one, and you want to come back for more. The worst offenders leave a reader feeling foolish for spending the time to consume the story, while the best make you glad that you gave up the lunch money and went hungry, so that you could read something that entertained you. 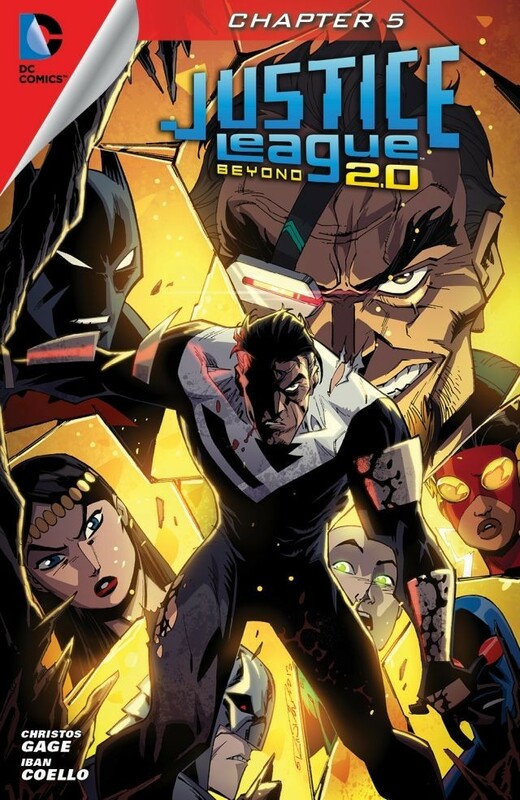 Justice League Beyond is able to get both things (reward and entertain) done, and if it can pull off a successful close, which is still a few issues away, it will have the hat trick that escapes most comics today. The main draw of the book, at least for this storyline, is Superman, and it's not a Superman that most writers seem to be aware of. In JLB, Superman is Big Blue, but he brawls. He's not corny, he's "old-school". That all important core is there: he helps others (coming to Jax-Ur's son's rescue of all things) and he never gives up (No powers? No problem. I trained with Batman, let's get it on!). JLB has the balance that makes for an engaging Superman, and has done it with less time, panels, and promotion. Even Captain Marvel is shown to be a capable leader, barking out orders and taking names. There is a freedom about the book that is missing from a lot of the "canonical" DC titles, and that liberty allows JLB to entertain instead of merely show up every two weeks. Art - 4: Could we have just a little more blood in the Superman/Jax-Ur fight? Please? Seriously, the aforementioned fight-scene is the jewel in the crown, as you can actually feel the impact when Superman connects on Page nine, Panel two. Cover Art - 3: The rating holds!